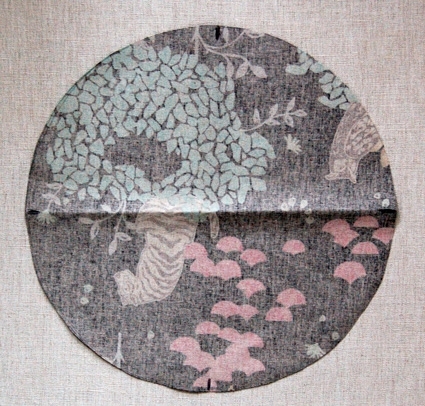 Echino Oilcloth. 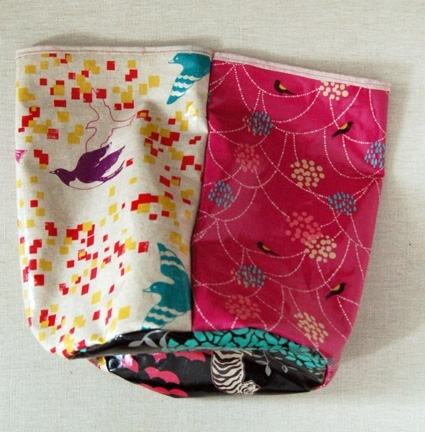 We love so many of these prints that we couldn’t choose just one so this bag features three! 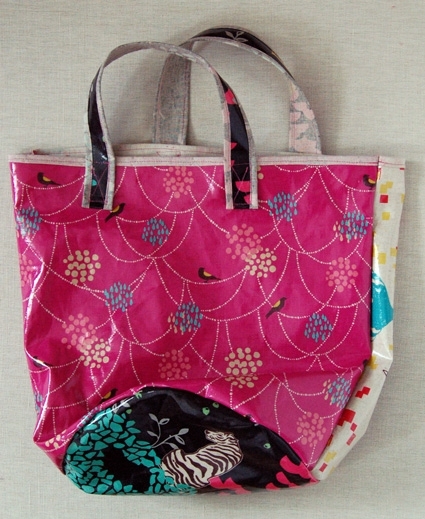 This tote is a truly quick and useful project plus it’s put together in a cool way since it has a circular bottom. Cut one 15 1/2-inch tall by 18-inch wide piece from each of the outer panel fabrics. Make sure the pattern is running in the correct direction. The shorter sides will vertical and the longer sides will run horizontally. 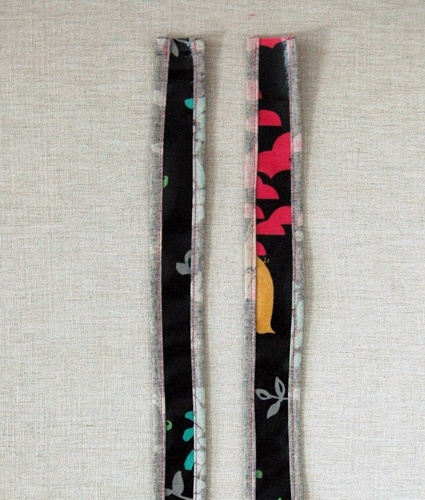 Cut a 12-inch length of string or leftover yarn. Tie one end of the string to the loop end of a safety pin so it’s secure. Pin the safety pin to the middle of the wrong side of the bottom fabric. 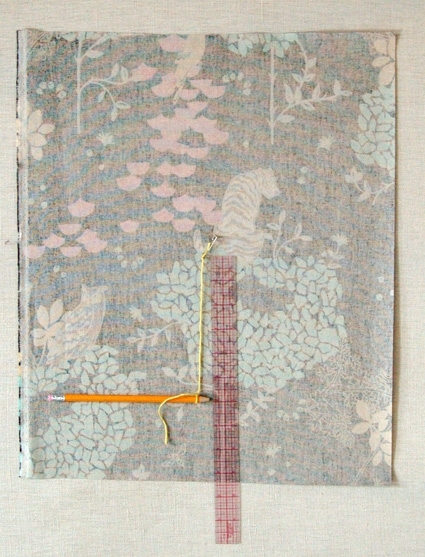 Pull the string taught and tie a pencil to the string, 5 1/2-inches from the safty pin. 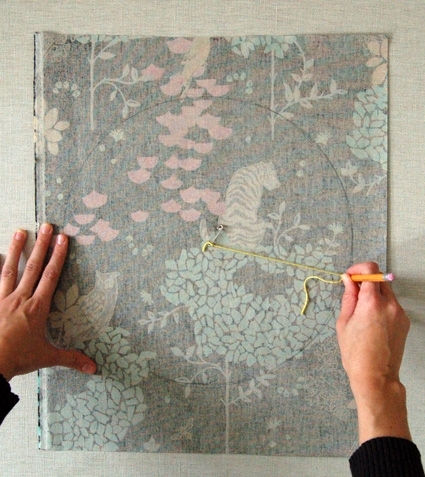 Hold down the fabric and trace a circle by keeping the pencil at a 90-degree angle and the string taught. 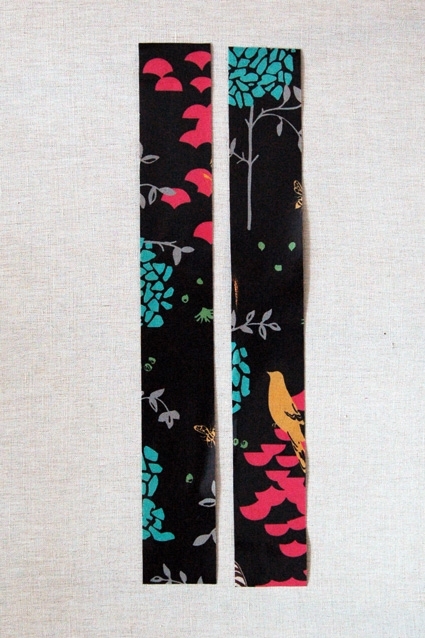 Cut two 18-inch X 2 1/2-inch strips from the handle fabric. Orient your outside panels so the right side of the fabric is facing you and the pattern is right side up, with the longer sides running horizontally. 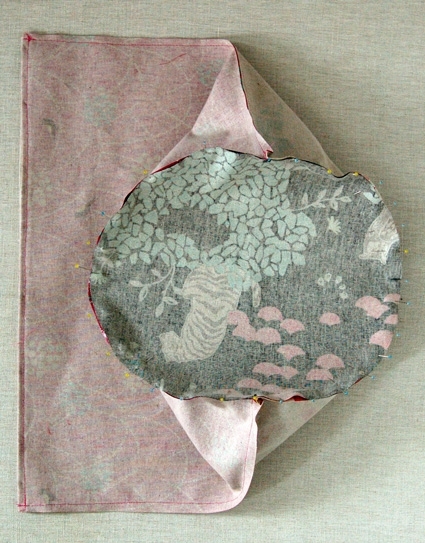 Fold the top long edge over onto the right side of the fabric a 1/4-inch twice and pin it down. Do this on both outside panels. 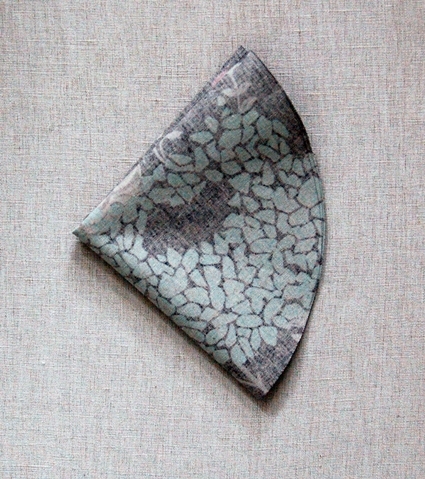 Sew this fold down with a scant 1/4-inch seam allowance. 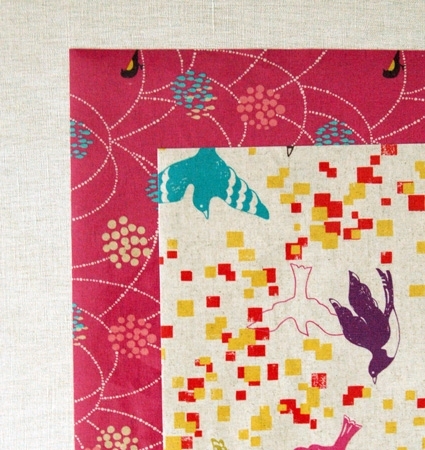 The wrong side of this fabric is a pretty natural linen blend so it makes a nice border! 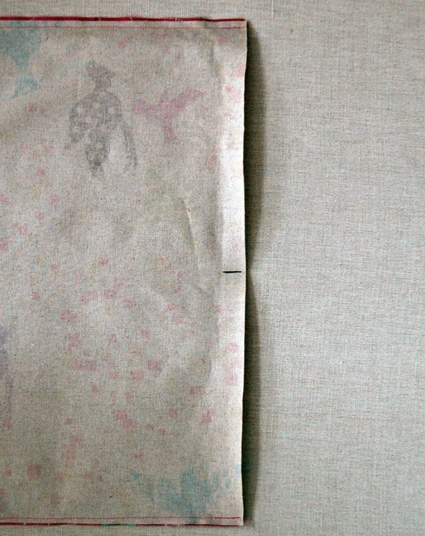 Pin the short sides of the outer panels right sides together with the top folds matching up. Sew the sides with a 1/4-inch seam allowance. Do not sew the bottom. This is now the bag body. 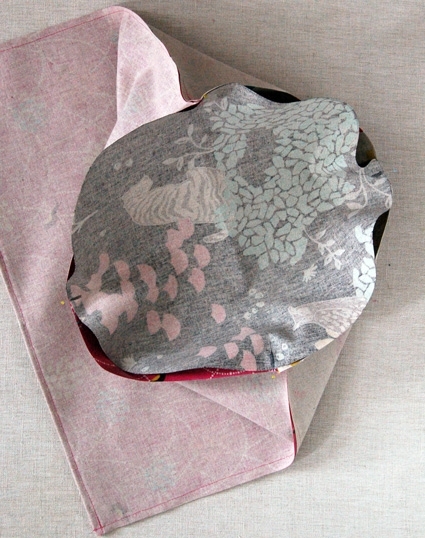 Fold your bottom circle fabric into quarters and mark it at the edge of each quarter fold as in the picture above. Fold the sewn together outer panels in half, side seam to side seam, and mark the middle on both sides. The side seams will represent the other two markings- thus marking the bag body into quarters as well. Pin the bag bottom to the bag body right sides together by first matching up and pinning the quarter markings on each piece as shown above. Then fill in the rest of the diameter with pins. You might need to do a bit of pulling to get the bottom panel to lay flat. Use as many pins as you need, the more the merrier! Sew around the diameter of the bottom panel with a 1/4-inch seam allowance and then zig zag stitch around the edge of the circle. Fold the long sides towards the right side of the fabric, 1/4-inch twice and pin down, just as you did for the top of the outer bag panels. Sew these folds down with a scant 1/4-inch seam allowance. Fold the short ends of the bag handles 1/2-inch to the wrong side and finger press down. Pin each sides of each of the bag handles to the bag 2 1/4-inches deep and 5-inches from nearest side seam as shown above. Make sure to keep the bag handle ends tucked under. Sew the handles 1/4-inch from the edge of the 2 1/4-inch X 1 1/2-inch rectangle where the handles are overlapping the bag body. 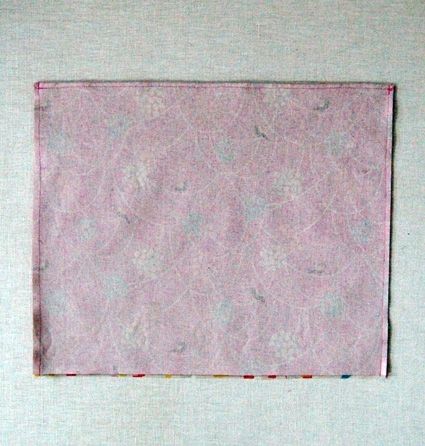 Then sew a big “X” through this rectangle to keep it nice and secure. 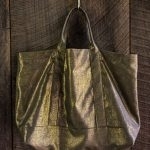 This is a great bag, thanks so much for sharing the “how to”. I will be giving this a go, it’s such a nice shape. Ontario, Canada’s grocery stores recently adopted a policy that they no longer provide plastic bags at the checkout. These are a great alternative to the chains’ branded bags. a really fantastic tote. 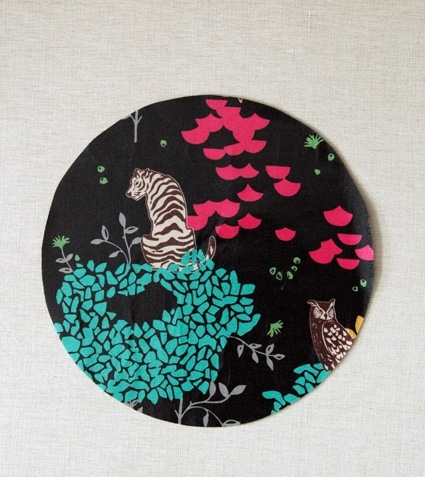 i love the pattern and colours of the oilcloth and the detail of the round bottom. i had to set a link to this tutorial. i hope, you’ll agree. Do you have any suggestions for the type of sewing machine needle to use with oilcloth? 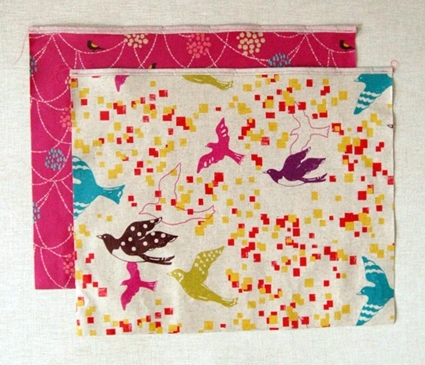 For this oilcloth you can use a universal needle. I wish I could make everything out of oilcloth! It’s so easy to sew and cut. Plus it keeps still and holds it’s shape. 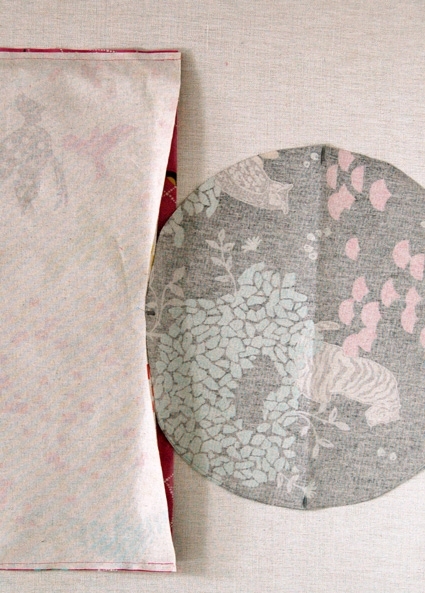 I just bought some of this fabric for another project and have some leftover…hmmmmm… Grocery bags a go go! Do the pinholes stay in the oilcloth? Seems like they would. I didn’t notice the pinholes after I was done. Much of the pinning is done to the linen/ cotton side of the fabric and not the coated side so it wasn’t a problem. 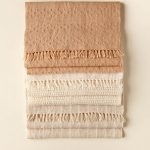 I also use really thin pins (available here: https://www.purlsoho.com/purl/products/item/1611) so that might help too. 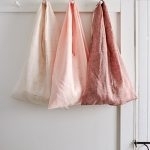 This is a fantastic alternative to the grocery-store-brand bags, not that there’s anything wrong with them. Thank you for this tutorial! 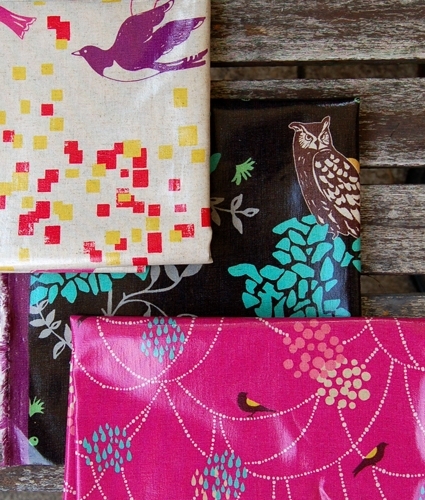 I’m looking forward to making some bags soon… my first oilcloth project, I think. Cute bag!!!!! I love it. what lovely oilcloth! and a great tutorial, thanks. What is “oilcloth”? I have never heard of it. Can you get it at any fabric store?? And about how much more or less would I expect to pay per yard?? THanks! Great idea, and you chose a great fabric, too. Wow, lovely bag – definitely going to have a go at this one. I’m visiting New York this week (from the UK) and am super excited to visit Purl and Purl Patchwork for some indulgent purchases. do you know if this is a PVC-coated cotton or an oil-based (non-petroleum) coating? The oilcloth is PVC coated. 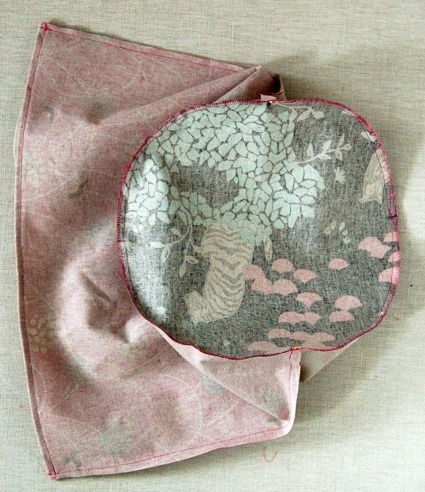 I believe that the base cloth is a linen cotton blend. 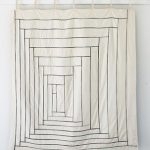 I just bought some of this fabric, and yesterday was making a pillow for my hammock with it, when I thought about how it would make a great bag – then I find your post this morning! I guess I’m going to have to order some more. Thank you for the tutorial, it will certainly be put to good use! This is such a great tutorial!! Where did you get such cute oil cloth? Do you expect to get more of this fabric? I love the selections you show here but they are sold out now! Should the dimensions of the sides should be 15.5 x 17 (instead of 15.5 x18)? I just made my first bag. I made it assuming that it would be taller than wide. I did not see that specified in the instructions but is that right? I hope so…I sewed the seams of the tops of all my bags already! P.S. I love it so far! 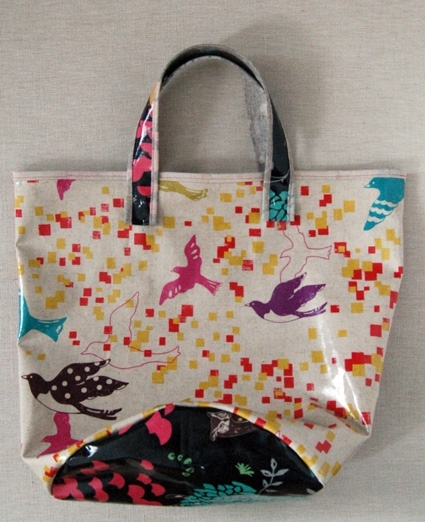 Hi–I am all set to sew this bag but wonder what the finished dimensions of the bag are? Also, I am not sure if the bag panels are 15.5 ” wide or high? Or is the height the 18″ length? This is important for the oil cloth fabrics that have a directional print. Also, I am assuming that the circular botton is 11″ in diameter–there must be alot of gathering of the oil cloth when you attach the circular bottom to the two bag panels–it doesn’t seem so from your photos. I just want to make sure I am doing this correctly before I start to sew. HELP!! I just finished making this bag to use as a gift bag for Christmas. It was quick to make and the instructions were easy to follow. Thank you! 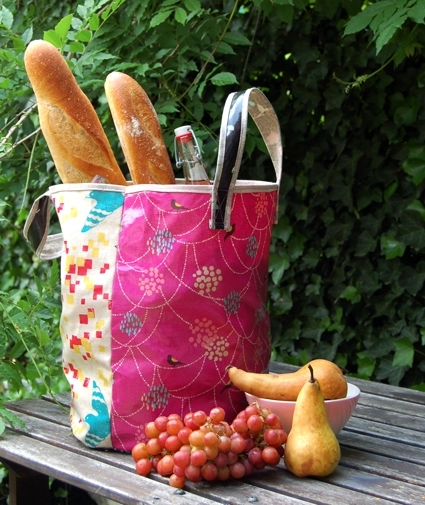 such a nice tutorial – great tote! It's on my got to make list. Hi, thank you for sharing this great tutorial. I've just finished makin this bag and I'm very happy with it!! Thanks a lot.